I was sick all of last week. Not flu-like, just a really bad head/chest cold. Today, the twins developed low-grade fevers (about 101, pre-tylenol). Eliana just threw up all over me as I was laying her down for her nap. (not just spit-up, but emptied the entire contents of her little tummy on my shirt). Aaron stopped by for lunch and said he'll probably come home early this afternoon to get some extra rest, as he's not feeling so great either. Surprisingly, having all 3 girls sick today feels "easier" than last week when I was feeling icky myself. We sure would appreciate prayers for speedy recovery for all! Joelle learned how to say "Da-da"! The January photo album is up. I'll continue to add pics throughout the month. I'm still working on posting oodles of adorable video from the last month. I have a few videos posted HERE, with more to come soon. 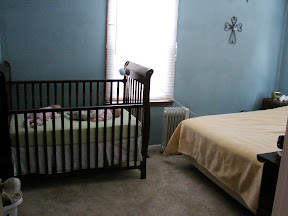 A few nights ago, we moved the crib into our room. 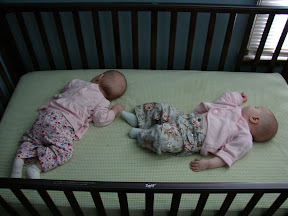 Eliana and Joelle are now sleeping there instead of in their bassinets. Having the extra room to move around has prompted a developmental leap. In the past few days since moving into the crib, the girls have started rolling over a lot. Prior to that, only Joelle had rolled over, and she had only done it once or twice. Now both girls roll from their backs onto their tummies frequently, and Joelle has rolled from her back to her tummy then onto her back again. They also end up sleeping on their tummies occasionally. Abigail has started potty training in earnest. She has had potty skills for a loooooong time (she first used her potty seat when she was 14 months old). But we were taking things really, really slowly and basically letting her own motivation lead until now. I decided that waiting was just going to make it harder, since in a matter of months the twins will likely be mobile (yikes!). She's now wearing diapers only for nap time, nighttime, and when we leave the house. So far, so good, with only a few accidents. Abigail's verbal skills can be quite endearing. I try to give her lots of praise when she says things that I want to encourage - like when she says "please" & "thank you", when she compliments people, or when she expresses gratitude or affection. The first time she said "I love you, too, Mommy", I got a big smile on my face and said "Oh, Abigail, that makes me so happy when you tell me that you love me." I explained that it's nice to tell people that we love them, because it makes people feel good to be appreciated. Now, almost every time I say "I love you, Abigail", she gets a big smile on her face and says "I wuv you, too, Mommy! Make you soooo happy!" One of my favorite things right now is listening to Abigail sing. She loves to make up worship songs and sing and dance for God. Here is a clip of her lying in bed before going to bed one night in December. She was singing "Happy Baby Jesus" - a song she made up. The video is from our video monitor (aka "spycam"). Today, Abigail was singing a song during naptime that included the lyrics : "Sacrifice, Jesus on the cross, I love you God, my special friend"